JEL classification: D21, F31, G32. The large increase in issuance by their overseas affiliates shows that EME firms' financing activities straddle national borders. Hence, measurement of external debts based on the residence principle can be problematic.4 In particular, external debt based on the residence principle may understate the true economic exposures of a firm that has borrowed through its affiliates abroad. If the firm's headquarters has guaranteed the debt taken on by its affiliate, then the affiliate's debt should rightly be seen as part of the firm's overall debt exposure. Even in the absence of an explicit guarantee, the firm's consolidated balance sheet will be of relevance in understanding the firm's actions. While this point has been well recognised in the realm of international banking (Cecchetti et al (2010)), it had not received much attention in the context of non-financial corporates until recently (Gruić et al (2014a)). The practice of using overseas affiliates as financing vehicles has a long history. Borio et al (2014) describe how in the 1920s German industrial companies used their Swiss and Dutch subsidiaries as financing arms of the firm to borrow in local markets and then repatriate the funds to Germany.5 As old as such practices are, they have become the centre of attention again in recent years due to the increasingly common practice of EME non-financial corporates borrowing abroad through debt securities issued by their affiliates abroad. If the proceeds of the bond issuance are used for acquiring foreign assets, the money stays outside and there are no cross-border capital movements. However, we will be focusing on the case where the firm transfers the proceeds of the bond issuance back to its home country, either to finance a local (headquarters) project, or to be held as a financial claim on an unrelated home resident - say, by being deposited in a bank or by being lent to another non-bank entity. If the overseas bond proceeds are repatriated onshore to invest in domestic projects with little foreign currency revenue, the firm will face currency risk. If the proceeds are first swapped into local currency, then the firm's activities are likely to have an impact on financial conditions (Box 1). In either case, the economic risks may be underestimated if external exposures are measured according to the conventional residence basis. Having obtained funds abroad (by issuing bonds offshore), the foreign affiliate of a non-financial corporation could act as a surrogate intermediary by repatriating funds (Chung et al (2014), Shin and Zhao (2013)). It can do that via thee main channels (Graph 1). First, it could lend directly to its headquarters (within-company flows). 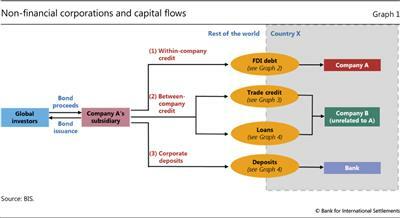 Second, it could extend credit to unrelated companies (between-company flows). Finally, it could make a cross-border deposit in a bank (corporate deposit flows). A practical question is how best to monitor these non-bank capital flows under the existing measurement framework organised according to the residence principle. 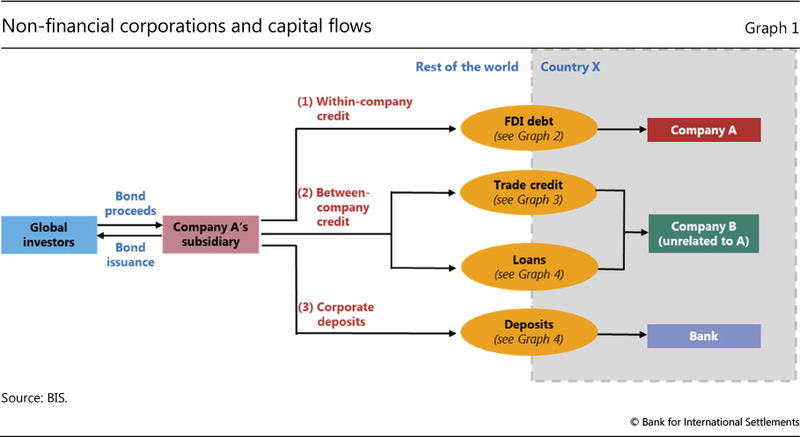 The balance of payments (BoP) accounting framework lists broad categories such as foreign direct investment (FDI) and portfolio flows, but it does not separate out the flows associated with corporate activity from those of the financial sector.6 However, a little detective work can reveal a wealth of information. 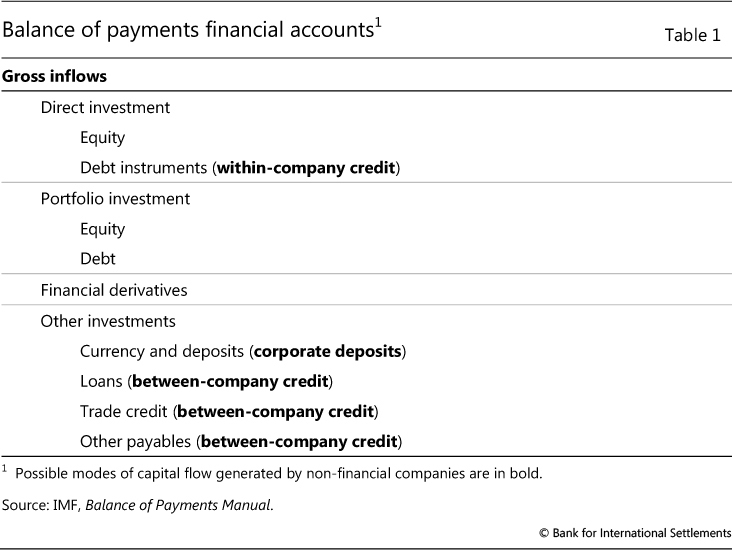 This article explores how the BoP data and some key items buried deep within the broad categories of direct investment and other investment can be used to shed light on cross-border capital flows through non-financial corporate activities (Table 1). When an EME company issues a US dollar-denominated bond in overseas capital markets and then repatriates the proceeds, one would expect that to show up as capital inflows in US dollars. However, this need not always be the case. The company or its overseas subsidiary can issue the bond and swap the proceeds into domestic currency before transferring the funds back to the headquarters. Obviously, there will be a similar increase in the headquarters' liabilities, but only the company's consolidated balance sheet would show an increase in foreign currency liabilities. For instance, Chinese firms have primarily issued US dollar-denominated bonds abroad, whereas non-Chinese companies account for a sizeable proportion of offshore renminbi bond (CNH) issuance (Graph A). Very often, these non-Chinese entities will swap their CNH proceeds into US dollars. In doing so, they are taking advantage of the cross-currency swap markets to obtain US dollar funding at lower costs than by issuing US dollar bonds (HKMA (2014)). Similarly, cross-currency swaps offer Chinese firms a channel to get around the tight liquidity conditions in China by swapping their US dollar proceeds from bond issuance into renminbi and remitting to their headquarters. In the rest of this article, we present evidence that capital flows to EMEs associated with non-financial corporations have indeed increased markedly over the past few years through three different channels. First, we demonstrate that transfers between firms' headquarters and their offshore affiliates have surged. 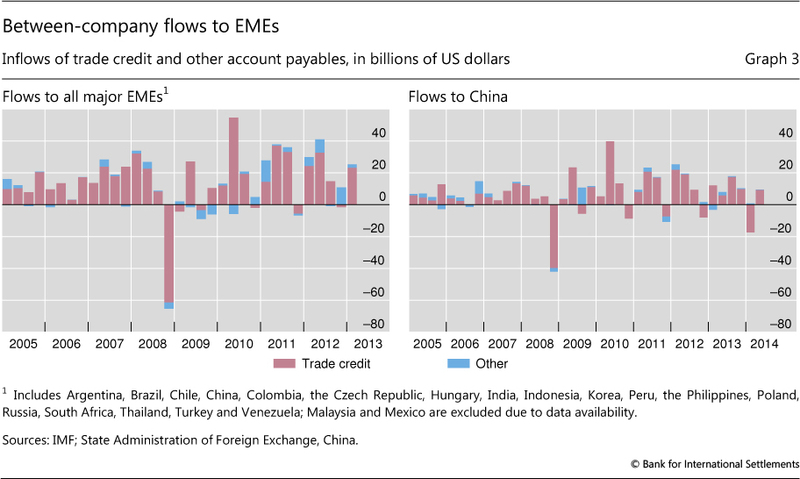 Next, we show that "non-bank" trade credit flows to EMEs have increased significantly. Finally, we demonstrate that the amount of external loan and deposit financing to EMEs provided by non-banks has grown considerably. 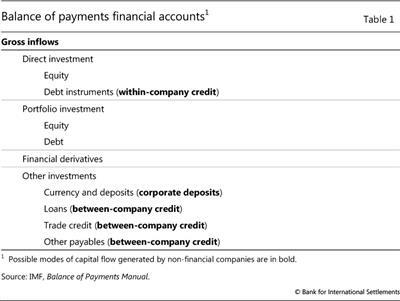 An accounting convention in the balance of payments deems borrowing and lending between affiliated entities of the same non-financial corporate to be "direct investment". Specifically, such transactions are classified under the "debt instruments" sub-item of direct investment. In contrast, borrowing and lending between unrelated parties are classified as either a portfolio investment or under the "other" category.7 The rationale behind treating within-firm transactions as direct investment is that the overall profitability of a multinational corporation depends on advantages gained by deploying available resources efficiently to each unit in the group. For example, tax considerations could drive the choice between equity and within-company debt, and behaviourally such debt can be, and often is, written down in adverse circumstances. Classifying the transfer onshore of funds obtained offshore as FDI raises questions about the traditional view that FDI is a stable or "good" form of capital flow (CGFS (2009)). This may be true for FDI in the form of large equity stakes associated with greenfield investment or foreign acquisitions. But within-company loans, especially if invested in the domestic financial sector, could turn out to be "hot money", which can be withdrawn at short notice. Thus, to the extent that within-company loans are financed through the offshore issuance of debt securities, they could be viewed as portfolio flows masked as FDI. Quantitatively, for most EMEs, within-company lending has been modest when compared with purchases of stakes in other companies (Graph 2, left-hand panel). 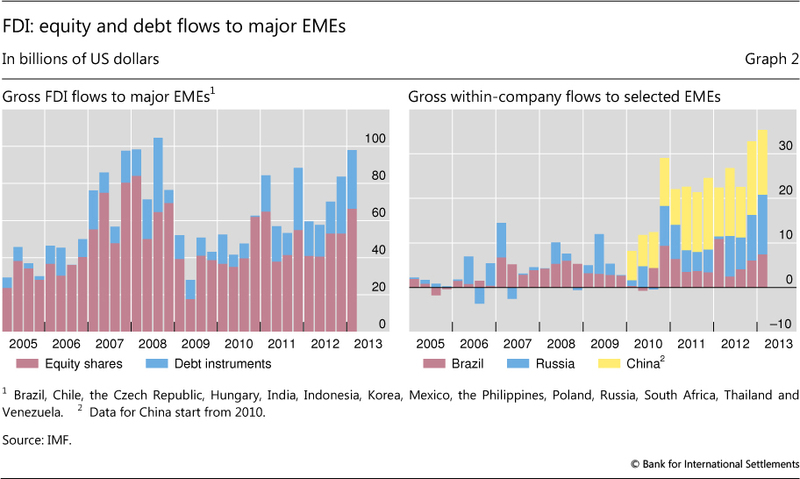 However, there have been sizeable increases in within-company flows in Brazil, China and Russia, amounting to more than $20 billion per quarter for these three countries combined (Graph 2, right-hand panel), which was broadly similar to the size of total portfolio inflows to the three countries during this period. Typically, trade credit flows between companies are small and account for a small proportion of total other investment flows in most instances. Direct credit extension between exporters and importers could be seen as much riskier than arranging trade financing through banks. 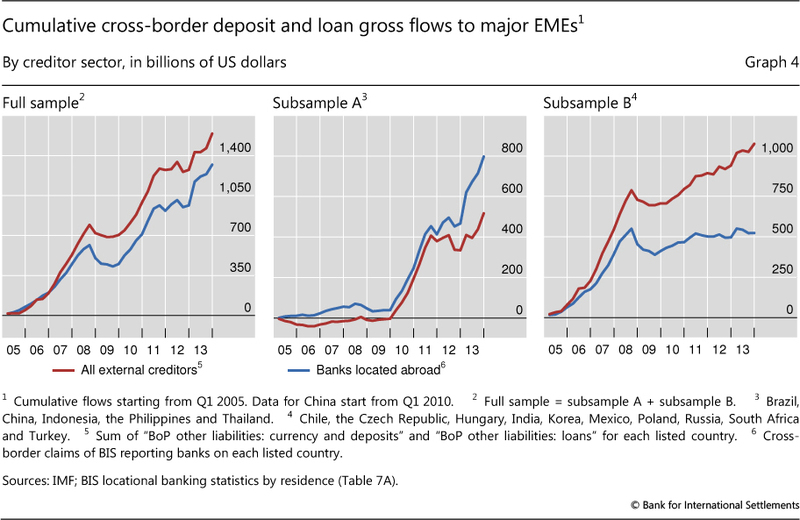 However, trade credit flows to EMEs have increased since the global financial crisis (Graph 3, left-hand panel), and the increase was driven, to a certain extent, by China (Graph 3, right-hand panel). 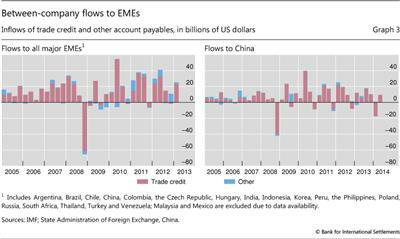 In fact, the share of trade credit inflows in total other investment in China in recent years has been much larger than that in other EMEs. While these trade credit flows to China may reflect Chinese companies' growing importance and credibility in world trade, trade credit could be another route through which the proceeds of offshore funding can be transferred to headquarters and/or unrelated companies onshore. 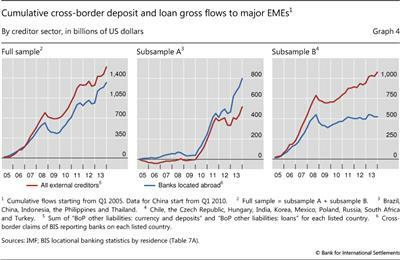 Despite the limitations of the existing data frameworks discussed above, it is possible to combine BoP statistics with the BIS international banking statistics (IBS) to shed some light on the growing importance of non-bank corporates in providing cross-border loans and deposits to EMEs. From the lender perspective, the IBS capture the cross-border positions of internationally active banks. As a consequence, the IBS could be used to measure the amount of cross-border loans that banks provide to residents (both banks and non-banks) of a given country. From the borrower perspective, a couple of (liability) categories in the BoP data provide information on the amount of cross-border financing that the residents of a given country obtain in the form of deposits and loans. More specifically, "deposit liabilities" capture the standard contract liabilities of all deposit-taking institutions in a given reporting jurisdiction to both banks (interbank positions) and non-banks (transferable accounts and deposits). Meanwhile, "loan liabilities" cover liabilities that are created when a creditor lends funds directly to a debtor, and are documented by claims that are not negotiable. This difference used to be small but has been increasing rapidly in recent years (Graph 4, left-hand panel).13 Up until 2007, the two series moved fairly in sync, suggesting that BoP deposits and loan flows were dominated by banks. However, the gap between the two series has been steadily growing and currently stands at approximately $270 billion (which amounts to 17% of cumulative BoP flows since Q1 2005). The growing gap between the BoP and IBS series could be interpreted as evidence of the increasing weight of non-banks in providing external loan and deposit financing to residents of emerging market economies. The rapid pace of financial globalisation over the past few decades has changed many aspects of international capital flows. To improve the understanding of these capital movements, in 2009 the IMF and its members agreed on a new template for collecting international financial transactions data: the sixth edition of the IMF's Balance of Payments and International Investment Position Manual (BPM6). From January 2015, the IMF will only accept data submissions under BPM6. In the transition period, some countries will still be publishing their BoP data under the previous template (BPM5, introduced in 1993) and the IMF will simply convert those "old" data to the new standard. 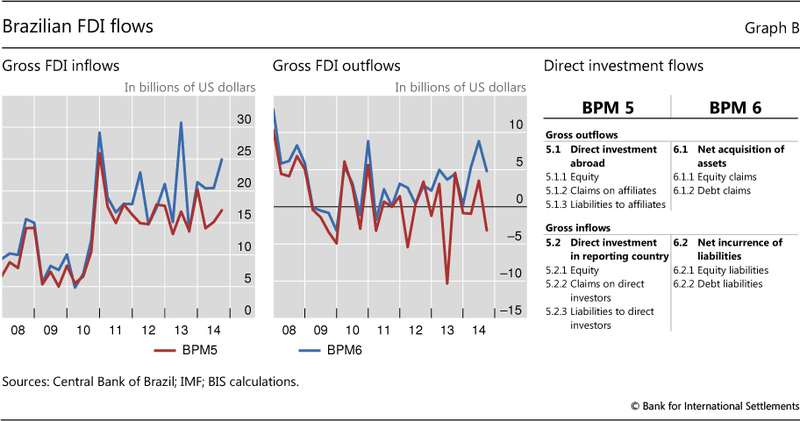 Using Brazil as an example, this box illustrates how the conversion between BPM5 and BPM6 affects the interpretation of FDI flows. Data published under the two formats reflect somewhat different treatments of within-company loans, resulting in differences in reported gross FDI inflows and outflows (Graph B, left-hand and centre panels), even though net FDI flows remain unchanged. This is because, under BPM5, FDI transactions between affiliates are recorded on a residence versus non-residence basis, whereas BPM6 differentiates between the net acquisition of assets and the net incurrence of liabilities. Simply put, under BPM5, both headquarter lending to affiliates (which increases claims) and borrowing from affiliates (which increases liabilities) are counted as gross outflows, albeit with opposite signs. Under BPM6, by contrast, the two activities will fall into different categories. While headquarter lending to affiliates will continue to count as capital outflow, borrowing from affiliates will be counted as net incurrence of liabilities (capital inflow). Using the notation in Graph B (right-hand panel), net acquisition of debt claims under BPM6 (item 6.1.2) will be the sum of items 5.1.2 and 5.2.2 under BPM5. While the above finding is intriguing in its own right, it also has important implications for the main question that we examine in this article. Namely, it suggests that, for the remaining EMEs in our sample, the aggregate size of the gap between the BoP and IBS series is considerably larger than the one implied by the estimates for the full sample. Indeed, as the right-hand panel of Graph 4 illustrates, the wedge between the BoP and IBS series is considerably larger for the latter set of EMEs (ie Chile, the Czech Republic, Hungary, India, Korea, Mexico, Poland, Russia, South Africa and Turkey). At the end of 2013, the BoP-implied external loan and deposit series for that group of countries exceeded its IBS counterpart by over $550 billion (51% of cumulative BoP flows since Q1 2005). This presents further evidence of the importance of non-banks in providing external loan and deposit financing to EMEs. The shift away from bank-intermediated financing to market financing over the past few years has coincided with a sharp increase in international bond issuance by EME non-financial corporations. This trend could have important financial stability implications. Yet, analysis of it is hindered by conceptual difficulties associated with statistical conventions on the measurement of cross-border flows. In this article, we utilise several key BoP data items to shed light on cross-border capital flows through non-financial corporate activities. We find that capital flows associated with non-financial corporations have indeed increased markedly over the past few years through three different channels. First, within-firm transfers have surged. 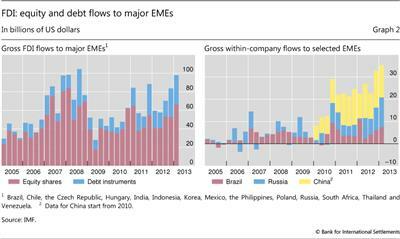 Second, trade credit flows to EMEs have increased significantly. Finally, the amount of external loan and deposit financing to EMEs provided by non-banks has grown considerably. We interpret those findings as evidence that the offshore subsidiaries of EME non-financial corporates are increasingly acting as surrogate intermediaries, obtaining funds from global investors through bond issuance and repatriating the proceeds to their home country through the above three channels. Borio, C, H James and H S Shin (2014): "The international monetary and financial system: a capital account historical perspective", BIS Working Papers, no 457, September. Borio, C, R McCauley and P McGuire (2013): "Global liquidity and credit booms", in B Winkler, A van Riet and P Bull (eds), A flow of funds perspective on the financial crisis, Palgrave Macmillan, November, pp 94-124. Cecchetti, S, I Fender and P McGuire (2010): "Toward a global risk map", in Central bank statistics: what did the financial crisis change?, proceedings from the Fifth ECB Conference on Statistics. Chung, K, J Lee, E Loukoianova, H Park and H S Shin (2014): "Global liquidity through the lens of monetary aggregates", IMF Working Paper, January. Committee on the Global Financial System (2009): "Capital flows and emerging market economies", CGFS Papers, no 33, January. 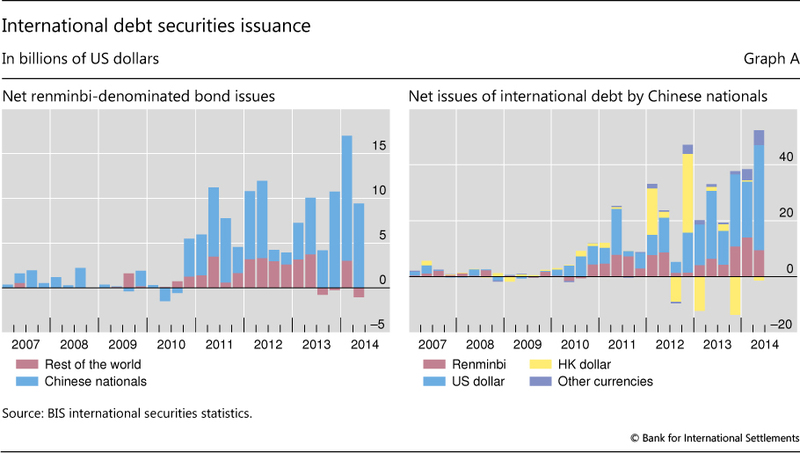 Domanski, D, I Fender and P McGuire (2011): "Assessing global liquidity", BIS Quarterly Review, December, pp 57-71. Gruić, B, M Hattori and H S Shin (2014a): "Recent changes in global credit intermediation and potential risks", BIS Quarterly Review, September, pp 17-18. Gruić, B, C Upper and A Villar (2014b): "What does the sectoral classification of offshore affiliates tell us about risks? ", BIS Quarterly Review, December, pp 20-1. Hong Kong Monetary Authority (2014): Half-yearly monetary & financial stability report, March. McCauley, R and R Seth (1992), "Foreign bank credit to US corporations: the implications of offshore loans", Federal Reserve Bank of New York, Quarterly Review, vol 17, Spring, pp 52-65. Shin, H S and L Zhao (2013): "Firms as surrogate intermediaries: evidence from emerging economies", working paper, December. 1 The authors would like to thank Claudio Borio, Dietrich Domanski, Branimir Gruić, Pablo García-Luna, Robert McCauley, Patrick McGuire, Christian Upper and Philip Wooldridge for their discussions. Deimantė Kupčiūnienė provided excellent research assistance. The views expressed are those of the authors and do not necessarily reflect those of the BIS. 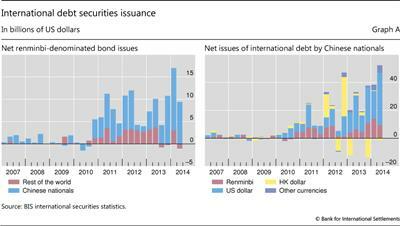 2 For further evidence of increased offshore bond issuance by EME non-financial corporations, see Gruić et al (2014b). 3 Chui et al (2014) outline the potential risks related to EME corporate balance sheets, focusing on the role of leverage and currency mismatch. 4 In international finance, the statistical convention is to identify the border as the boundary of the national income area, so that what is "external" or "internal" is defined by reference to that boundary. This statistical convention gives rise to the residence principle. A firm is resident in a particular national income area (or "economic territory") if it conducts its business activities mostly within the boundaries of that economic territory. 5 Even to this day, Germany is one of the few developed countries where non-financial firms are still generating large within-company capital flows across borders. During the past five years, gross direct investment flows to Germany totalled $185 billion, $73 billion of which were for equity acquisitions and the rest were debt transfers between a firm's headquarters and its affiliates. 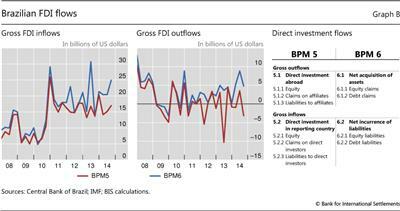 6 Reporting of sectoral data, however, is included in the sixth edition of the IMF's Balance of Payments and International Investment Position Manual (BPM6) published in 2009 and last updated in November 2013. The IMF will only accept data submitted under this new template from January 2015 (Box 2). However, only a small number of EMEs are expected to submit granular sectoral data in the near term. 7 Lending and borrowing between affiliated deposit-taking corporations (ie intrabank flows) are an exception to the above rule. They are classified not as FDI (debt), but as "other investment" (loans and deposits, respectively). 8 Other firm-to-firm cross-border transactions such as account payables/receivables are simply recorded under "other" in "other investment". 9 Using a slightly different approach, Domanski et al (2011) decompose total (domestic and cross-border) credit to a number of advanced economies by creditor sector (bank and non-bank). 10 In the context of our discussion, the category "non-banks" includes both non-financial firms and non-bank financial firms. That said, in the case of EMEs, a large part of the latter group is accounted for by the non-bank financial vehicles of non-financial corporates. 11 Note that intrabank flows are included in both the IBS series on cross-border bank lending and the BoP series on external deposit liabilities (see footnote 7 for additional details). 12 In theory, the variation between the BIS and the BoP data could also be due to residents' cross-border liabilities to banks located in countries which do not report data for the IBS. In practice, given the fairly comprehensive coverage of the IBS (which captures approximately $30 trillion worth of cross-border claims that belong to banks located in 44 jurisdictions), it is reasonable to assume that the above accounts for a negligible part of the overall wedge between the two series. 13 The data used to construct the IBS series are available in BIS Statistical Table 7A. 14 McCauley and Seth (1992) and Borio et al (2013) find that, for the United States, figures from the IBS data on external bank loans considerably exceed those based on the respective flow of funds data. 15 Potential data reporting-related sources of discrepancy include the coverage of the reporting population, the treatment of bank-supported trade credit and the exchange rate valuation adjustment methodology.